I wanted to take my boys sledding. I didn’t want to spend money to do it. My friends were going to places like Greer and Flagstaff. Loads of snow but they were also staying in hotels. Not ideal. My friend Becca lives in Tucson near Mt. Lemmon. She takes her boys sledding in the snowfields at the top of the mountain. Becca let me borrow her sleds, I popped into Walgreens and bought gloves, 2 pairs for $6.99. I dressed the boys in warm sweats and then looked at their shoes. My boys have crocs, sneakers and no boots to speak of. Feeling wet and cold would put a quick end to our fun. I was thinking bread bags? Ziplocks? I found a big box surgical gloves. I took 4 pairs of gloves. I put socks on the boys, slipped a pair of gloves as far as it would go on their feet. Then I snipped the fingers off the second pair and stretched the gloves over their ankles like gaiters. I tucked their pants into the gloves. It looked funny but it worked! Their socks stayed dry. The boys called them Sea Monsters. The drive up Mount Lemmon is gorgeous. It’s listed as a top drive in Scenic Driving Arizona. It made me want to go home and watch Lord of the Rings that night. Along the way, I had a bad feeling. The snow was in patches, the road wended upward. I saw steep cliffs, signs about bears. Evidence of the devastating wildfire a few years ago was still evident as I saw hills spiked with charred pines. We pulled over in one likely spot and I wandered downhill to check it out and lo and behold, echoing chasm–oh my goodness. Back in the car and up the mountain we went. We ended up in Summerhaven, a lovely resort town. Driving through the tiny town, we found an adorable wee lodge christened “Santa’s House” and behind that, an empty lot. The lot was covered with snow and bore evidence of sled runs. The hill dipped into a tiny gully, perfectly scaled for my boys, aged 6 and 4 to sled. Surrounding this lot were other empty lots and homes with “For Rent” signs which set us all to day dreaming about an oasis in the pines during the hot summer months. The boys played happily for two hours. I had a change of clothes in the car and a picnic. When we finished sledding we drove into town (one block) and used the modern heated restroom in the Community Center. The entrance is on the street. It was very clean. Parking was easy, the drive back down was made more exciting watching bikers tuck themselves into bullets and zip the switchbacks faster than our car could go. 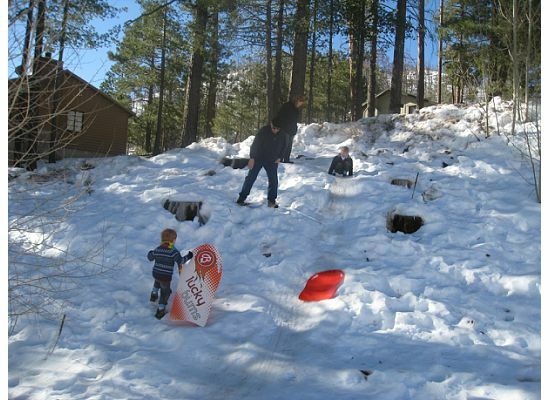 Mount Lemmon is home to the southernmost ski resort in the country. Summerhaven’s local businesses were open. The Mount Lemmon Cookie Cabin in particular smelled delicious from our hill. My youngest is 4 and I knew a restaurant would be a mistake, that a nap was in order. We will be back again, this town is a special place. I hope you can visit soon.